Wright State University is responding to the growing threats to computers and data networks with a new Master of Science degree in cyber security. The Department of Computer Science developed the program with advice from an external advisory board that included local business executives and experts from Wright-Patterson Air Force Base, said Department Chair Mateen “Matt” Rizki, Ph.D. The Dayton region has a large need for people with advanced cyber skills because of its concentration of national security missions at Wright-Patterson and a large community of defense-related companies, Rizki said. Wright State offered the first courses this semester. Rizki said the program requires 30 semester hours, which typically should take about 18 months to complete. “This is an excellent addition to Wright State’s course offerings,” said Jim Petro, chancellor of the Ohio Board of Regents, which recently approved the program. “As technology gets more advanced, there is a greater need for increased security. And with Wright-Patterson Air Force Base nearby, the region will benefit immensely from the MS in cyber security program,” Petro said. The program is tailored for people already working in the information industry, with evening courses and the option of working on research projects with industry partners instead of a traditional thesis project. Rizki said the program makes Wright State the first university in Ohio to offer a Master of Science degree in cyber security, and it will help position the university to become a National Center of Academic Excellence in Information Assurance Education, a National Security Agency designation. Wright State already offers certificate programs for cyber security professionals through its Institute of Defense Studies and Education. 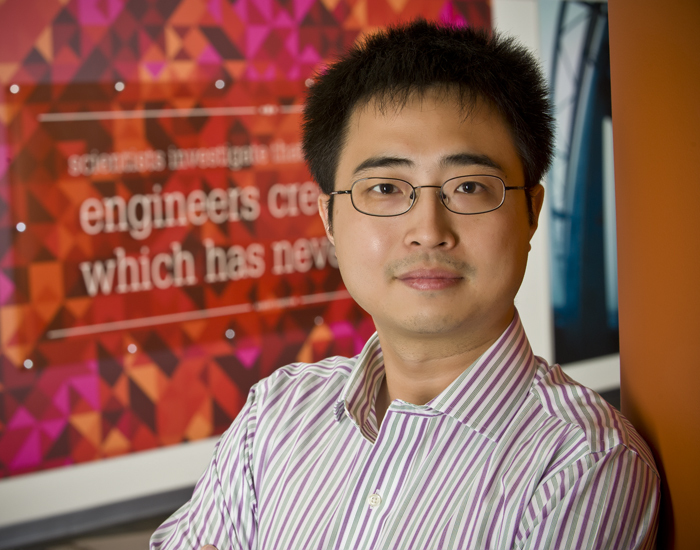 The program puts Wright State in the forefront of universities across the country that are beginning to offer advanced degrees in cyber security, said Assistant Professor Junjie Zhang, Ph.D. “It is an emerging trend for a lot of universities to have this program,” he said. Wright State hired Zhang in August from the Georgia Institute of Technology in Atlanta. He’s one of two new faculty members the university is hiring for the cyber security program. Zhang said the program attracted him because it offers “a great potential to collaborate with external institutions” as well as university faculty in different departments. Private businesses, government agencies and even public utilities face increasing threats to the security of their data, computers and networks, Rizki said. “There clearly is the recreational hacker out there who’s trying to demonstrate their skills at penetrating systems,” Rizki said. “Unfortunately, we are seeing an increasing number of individuals who are looking for information that has financial value and groups who intend to acquire information to harm national security,” he said.